It’s the dawn of a new year, and what better way to greet the new year than with a smile? While certainly smiling can go a long way in starting 2019 on a positive note, if you are unhappy with your smile or consider it a source of embarrassment, this might be an issue for you. While it varies from person to person, perhaps the most common issue amongst people pertains to the color of their teeth. Fortunately, much like 2018 such issues with your smile can soon be a thing of the past. In the consistently evolving world of modern cosmetic dentistry, much can be done to remedy this issue and minimize any stains, blemishes, or sighs of aging that your teeth may have incurred. 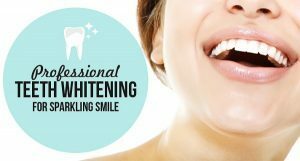 We’re willing to guess that it would be a beautiful, pearly white masterpiece, or what’s sometimes referred to as the “classic Hollywood smile.” While this may seem far-fetched, thanks to our professional teeth whitening service offered here at Overland Park Dentistry, the smile of your dreams may only be an appointment away! Related Article: Say Cheese with Cosmetic Dentistry Options! Although DIY whitening strips and trays can be purchased at local convenience stores, for the safest and most effective results, utilizing a professional teeth whitening service is your best option. This is a very common dental procedure that can be performed by your dentist in approximately 60 minutes, depending on the severity of the staining and will almost certainly produce the desired result. In preparation for your whitening, a dentist or hygienist will first need to give your teeth a basic cleaning, to remove any bacteria or plaque buildup that may have accumulated around them. Once cleaned, a hard resin is administered to protect the gums, shortly followed by a hydrogen peroxide gel which is applied to each tooth. The gel remains coated on the teeth for around twenty minuets as the substance bleaches the teeth to a whiter shade while simultaneously diluting any stains or discoloration they have accumulated. Once the first coat is removed, a second coat of bleaching gel is applied, and the process is repeated once more to maximize the solution’s effectiveness and achieve the best results. After your professional teeth whitening treatment is fully complete, your teeth may feel tingly and strange; however, this sensation should subside shortly. Additionally, your dentist may suggest that you temporarily avoid certain food products, as the artificial dyes in some products may hinder the progress. Although you smile will be noticeably whiter after the treatment, you may be required to return for a follow up exam as it will likely take a matter of days for the treatment to take full effect. Upon your next appointment, your dentist will examine the overall effectiveness of the procedure, to determine if any adjustments are to be made or if any future recommendations are necessary. Professional Teeth Whitening… Start 2019 With A Smile! It’s the dawn of a new year, and as we said before, what better way to greet the new year than with a smile? Smiling is one of the simplest joys in life and nothing should keep you from smiling in 2019. So, if pesky stains and blemishes on your teeth have you frowning, our team of specialists at Overland Park Dentistry is here to help! For questions or more information on professional teeth whitening or any of our cosmetic services, please contact our offices and smile brightly in in this new year!